WIFI is provided free of charge and all the sky channels including movies and sports are available. Warm hospitality and quality service in a friendly atmosphere is always assured. We look forward to hearing from you. Harman means 'pleasing everyone, welcoming all'. 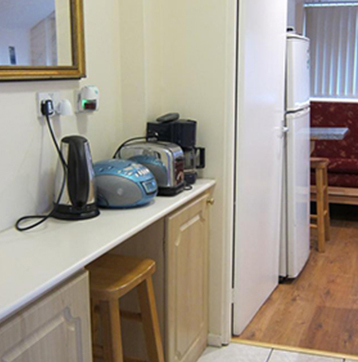 You are wholeheartedly welcomed to one of the best and most highly commended self-catering apartments in Leeds, where you can enjoy your stay to your utmost convenience and satisfaction. "We assure you the best service at the best price." Harman Suites are awarded 3 stars graded by Quality in Tourism on behalf of Visit England. These are well-furnished, fully-equipped, self-contained, en-suite, high quality ground floor detached apartments. The suites are compact and comfortable, elegantly and tastefully furnished, and situated in quiet, peaceful and safe surroundings. WIFI is provided free of charge and all the Sky channels including Movies and Sports are available in both the Harman Suites. Harman Suite 1 provides a king-size bed, en-suite and open plan lounge/fitted kitchen with double sofa bed facility accommodating up to 2 adults + 1. Harman Suite 2 is a studio flat and provides a double bed and an en suite with an open plan fitted kitchen accommodating up to 2 adults. Both suites feature a cot, instant gas and water heating, along with a cooker, microwave, television with cable viewing, video player, fridge freezer, washing machine, vacuum cleaner, CD/cassette player, tea/coffee maker, ironing facility, hairdryer, bed linen, towels and all necessary cutlery and utensils. Harman Suites are close to public transport, shops, banks and good restaurants with easy access to the city centre, university and hospitals. The local landmarks within 10-15 minutes' drive from Harman Suites are Leeds University, Leeds Metropolitan University, Leeds General Infirmary, St. James Hospital, Headingley Stadium and Leeds United's ground. Chapel Allerton Hospital is only 5 minutes' walk from Harman Suites. The word Harman translates to ‘pleasing everyone and welcoming all’, and this couldn’t be more true for the 3 star rated Harman Suites 1 & 2, where great customer service enables guests to enjoy a relaxing getaway in the heart of one of England’s most animated cities - Leeds. Having provided comfortable and compact self-catering accommodation for the past decade, Harman Suites 1 & 2 present elegantly furnished surroundings with towels and bed linen supplied for guests’ convenience. 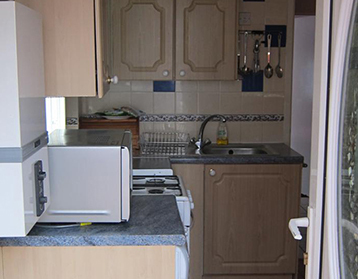 Both suites offer high quality ground floor accommodation with fully fitted kitchens and contemporary decor. Situated in quiet surroundings near Leeds city centre, guests can take advantage of the central location with days out shopping at Leeds Shopping Quarter or spend leisurely afternoons admiring the modernisation of City Square with the famous Black Prince statue, Cultural Quarter or Skyscraper Quarter. The suites provide a private patio where guests can sit back and relax in a safe environment after a day out touring and exploring. Harman Suites 1 & 2 are also the perfect base for those visiting relatives or friends at Leeds University, Leeds Metropolitan University, Chapel Allerton, Leeds General Infirmary and St James Hospital; the accommodation is well suited to those wishing to take the short drive to Headingley Stadium or Leeds United's ground. © 2019 Harman Suite All rights reserved.